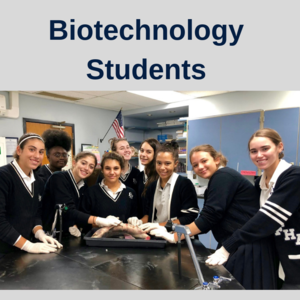 Mrs. Ashkenazy’s Biotechnology class have submitted two proposals to the prestigious Urban Barcode Project Competition. In this competition students from all over New York will isolate a unique DNA barcode of different species. Click on headline link for more. Mrs. Ashkenazy’s Biotechnology class submitted two proposals to the prestigious Urban Barcode Project Competition. In this competition students from all over New York will isolate a unique DNA barcode of different species. Just as a unique pattern of bars in a universal product code (UPC) identifies each item for sale in a store, a DNA barcode is a DNA sequence that uniquely identifies each species of living thing. Tommasina Cardone, Julia Nelson, Giuseppa Bruno and Margaret Minogue proposal to “barcode” the Illex illecebrosus (a species of squid), and Julia Perez, Elizabeth Carmody and Maya Volchock proposal to “barcode” Limnodynastes tasmaniensis (a grass frog) were accepted. In this picture, they have been examining a dogfish shark - as Anna Acevedo and Lenette Aaron would like to “barcode” Squalus acanthias (a dogfish shark).